Originally built in the 1920's, this 16-bedded lodge captures the history and romance of the "colonial era". 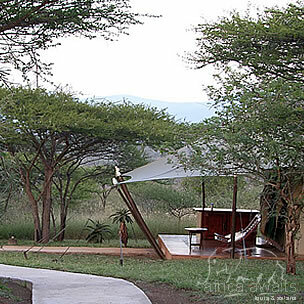 Luxurious, tented safari lodge with the ambience and romance of a bygone era. 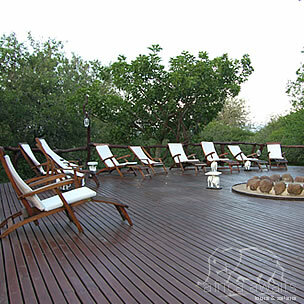 Spectacular views of the majestic Lebombo Mountains and distant waters of Lake Jozini. Originally built in the 1920's, this 16-bedded lodge captures the history and romance of the "colonial era". The sweeping views and tranquil setting provide the venue for a unique African experience. Eight luxurious safari-style tents, each with en-suite bathroom, outdoor canvas shower, private veranda and personal bar, ensure a secluded retreat in unspoilt savanna bushveld teeming with game and birdlife. Unwind with dusky birdcalls, moonlit vistas and the distant gentle lapping of water. Luxurious, tented safari lodge with the ambience and romance of a bygone era. Spectacular views of the majestic Lebombo Mountains and distant waters of Lake Jozini. Game drives, guided walks and elephant tracking. Brilliant bird-watching and game viewing. Tiger-fishing and sunset lake cruises. Excellent cuisine and personalised service. Private, exclusive experience. Safari Lodge: Surrounded by the majestic Lebombo Mountains and shimmering waters of Lake Jozini, the Safari Lodge offers every comfort for your sojourn in the African wilderness. Pongola Game Reserve The Pongola Game Reserve was first proclaimed in 1894 and is the second oldest reserve in the world. It is a sanctuary to a large variety of wildlife, including giraffe, wildebeest, zebra, impala, hyaena, buffalo, rhino and leopard. Exactly 100 years ago after the last sighting of elephant in the Pongola area, two breeding herds were reintroduced. Birdlife is prolific due to the diversity of habitats, with in excess of 350 species recorded. Pongola Game Reserve is a co-operative conservation project between private landowners, tribal communities and government conservation services, and aims to form the heart of a large ecological and socio-economically viable "Big Five" reserve. Allied to this quest the "Space for Elephant" Foundation has been formed to realise the goal of a biosphere large enough to viably sustain an elephant population of a thousand elephants and allow the re-establishment of the ancient elephant migration routes. Celebrate life's safari and it's beautiful moments. Journey into the wilderness with us where we learn to understand the fragile balances and subtleties in nature. Share with us our visions, commitments and dreams. Help us to preserve a precious piece of Africa for future generations. Journey into the bush on a game drive or a bush walk with one of our professional guides who will share with you what we have learnt and explore together that which we still need to learn. A cycling safari on dusty African roads in the late afternoon sun will heighten your senses and invigorate the soul. 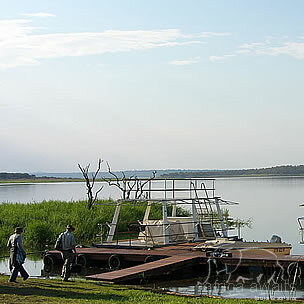 Gentle boat cruises on lake Jozini add a new dimension to game viewing and birdwatching. Hear the haunting fish eagle cries, hippos snorting, feel the winds whispering against your skin, inhale the tranquillity and solitude of Africa. Test the shimmering waters for 'tigers' with our expert fishing guide to assist you. Rhino walks are an exhilarating experience, allowing you to gain a closer understanding of these prehistoric mammals, their ways and their battle against extinction. 'Elephanting' will give you so much more than the mere thrill of sighting elephants. As you participate in our Research Programme, you will learn to 'see' elephants differently. Stand in their footsteps and feel their mighty presence. Explore with us their problems in today's world and learn with us about our 'silent' elephants. From the novice fisherman to the expert anglers fishing with a fly, Lake Jozini offers you the ideal location for tigerfishing of a lifetime, while you enjoy the pristine wilderness setting that compares favorably to the wilds of Lake Kariba in Zimbabwe Soar over the majestic Lebombo mountains and our corner of Africa with Zululand Mission Air Transport. This special 'flying doctor' service brings medical assistance to the people in the remote rural areas of Maputaland. You will gain a new insight into Africa's soul and her needs, from ZUMAT's committed pilots. Discover the mystery and magic of zulu culture by taking part in our Umgano or Uthambothi tours. A visit to Dumazulu Cultural Village and Illala Basket Weavers can be arranged, as well as visits to rural schools, zulu chiefs and herbal doctors. Venture a little further into some of Maputaland's other wonderful Game and Nature Reserves (Hluhluwe-Umfolozi, Mkuze, Itala, Ndumu, Tembe and the Greater St. Lucia Wetland Park). With your holiday, safari or business trip from in to White Elephant Safari Lodge in Kwazulu Natal.